When the first colonists landed on Roanoke Island in 1587, they likely wrote letters to friends and relatives back home in England. For a small fee, the ship's captain would then transport the letters to Europe. A transaction such as this represented the birth of postal operations in America and North Carolina. In 1710 the British Parliament passed an act that specifically provided for the management of a postal system in the colonies; by the 1730s Deputy Postmaster General Alexander Spotswood had extended delivery through North Carolina to Charles Towne (Charleston, S.C.). Mail coach service arrived in 1744. In 1789 North Carolina had 4 post offices, operating in Edenton, New Bern, Washington, and Wilmington; by 1851 it had 785. Railroads, which came to the state in 1836, soon became the chief means of carrying mail, employing special cars to pick up mail at railway stations and process it on the train for delivery farther down the line. Regular use of postage stamps began in the late 1840s; the first U.S. postage stamps of 5-cent and 10-cent denominations were delivered to Elizabeth City on 13 Mar. 1848. By 1861 North Carolinians had become accustomed to regular and timely mail delivery. The Civil War and Reconstruction disrupted the postal service and forced staffing changes. Individuals who had a formal role in the Confederacy could not serve in a formal capacity for the Union, so Confederate postmasters were not eligible to fulfill their duties after the war. As a result, the number of female postmasters in North Carolina increased significantly. During this time most post offices consisted of a table in a prominent citizen's home or in the local general store or tavern. Mail was delivered and placed on the table, though a few offices in larger cities had pigeonholes for sorting the mail. Citizens were responsible for collecting their mail at the post office, and unclaimed mail was advertised in the local newspaper, for which an additional two cents would be charged. A major change in postal operations occurred in 1899 with the beginning of the rural free delivery experiment. In North Carolina, China Grove was one of the first towns to test the system, in which mail carriers would deliver and pick up mail in rural areas for no additional charge. It took months, however, for the China Grove carriers to convince residents to try this new system. North Carolina's first airmail was carried from Wilmington in 1912, but it was not until 1928 that regular airmail service was flown over the state on a route from New York to Miami. A 1948 postal experiment utilized trucks to carry and process the mail, and these highway post offices, as they were called, lasted until 1972. The last mail was carried by train in the 1970s. Today most mail going any distance travels by air, while local mail is carried by truck. In 1892 the U.S. postal system began issuing stamps to commemorate people, places, or events, and in 1937 North Carolina celebrated publication of the state's first historical stamp, which depicted Virginia Dare. Eight days later a special souvenir sheet was issued in Asheville in honor of the Great Smoky Mountains. Since then, additional stamps have been issued in North Carolina to honor the Roanoke voyages, the Wright Brothers, the Carolina charter, and North Carolina statehood. Six postal cards have also been issued in the state, honoring the University of North Carolina at Chapel Hill, North Carolina beaches, and the Battle of King's Mountain, among other landmarks. Richard Ridgway, Self-Sufficiency at All Costs: Confederate Post Office Operations in North Carolina, 1861-1865 (1988). Alex ter Braake, The Posted Letter in Colonial and Revolutionary America, 1628-1790 (1975). "North Carolina State Archives Postal History Project." Division of Archives and Records. 2010. http://exhibits.archives.ncdcr.gov/postal/#database (accessed November 1, 2013). Stroupe, Vernon S. "Postal History - The Basics" from the Final Report of the North Carolina Postal History Commission. http://exhibits.archives.ncdcr.gov/postal/postal_history_basics.pdf (accessed November 1, 2013). "ARTICLE 71. North Carolina Postal History Commission." Session laws and resolutions passed by the General Assembly. Raleigh, N.C., 1997. p. 1825. http://archive.org/stream/sessionlawsresol19972nort#page/1824/mode/2up. North Carolina Postal History Commission. Interim report of the North Carolina Postal History Commission. Raleigh, N.C.: N.C. Postal History Commission, 1998. North Carolina Postal History Commission. Annual report of the North Carolina Postal History Commission. Raleigh, N.C.: N.C. Postal History Commission, 1999. North Carolina Postal History Commission. Final report of the North Carolina Postal History Commission. Raleigh, N.C.: N.C. Postal History Commission, June 2000. 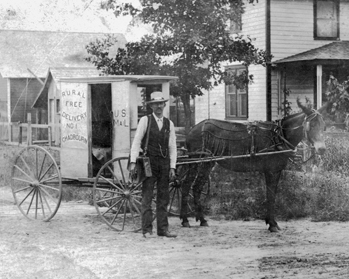 A Rural Free Delivery mail carrier at Chadbourn, early 1900s. North Carolina Collection, University of North Carolina at Chapel Hill Library. 1 January 2006 | Crumbley, Tony L.